BP-240 : Alkaline Battery for ICOM radios. Fits IC-A14, IC-A14S, IC-F43TR, IC-F33GT, IC-F33GS,IC-F34GT, IC-F34GS, IC-F43GT, IC-F43GS, IC-F44GT, IC-F44GS, IC-F14, IC-F14S. Holds 6 x AAA dry cells. Handy for instant power ! Replaces BP-261, BP-232. CBE-232 : Battery Eliminator for ICOM IC-A14, IC-A14S, IC-F14, IC-F24, IC-F33, etc. 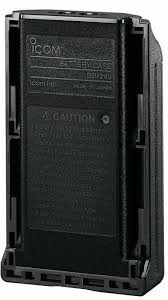 The CBE-232 is a battery eliminator for ICOM radios such as IC-A14, F24, F33, F43, F3011, F3021, F3061, F3161, F4011, F4021, F4061, F4161, etc. It enables Hi-Watt operation from a 12-13.8VDC power source (DC socket, portable 12V battery). BP-232N: 7.4 volt 2200mAh rechargeable Li-ION battery for ICOM radios. Fits MANY models! 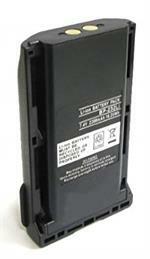 BP-232N: 7.4v 2200mAh Li-ION battery for ICOM handheld radios. Fits ICOM IC-F14/S, IC-A14/S, IC-F24/S, IC-F33G/GT/GS, IC-F43G/GT/GS/TR, IC-F3011, IC-F3021T/S, IC-F3061, IC-F3161T/S/DT/DS, IC-F4011, IC-F4021T/S, IC-F4061, IC-F4161T/S/DT/DS, etc. 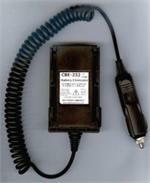 EMS-232 : Desktop Rapid-Smart Charger for ICOM-style Lithium ION batteries such as BP-231 and BP-232. Charges battery alone, OR you can insert the entire handheld into the charger. Automatically shuts off when battery reaches full charge.